The following is a guest article written by Fabrice Bouland, CEO and co-founder of Paris-based research portal Alphametry. Active asset management is facing challenging times. New business pressures and regulations are now threatening its historic model. Barely eight months from now, investment research in Europe will no longer be free, encumbering the acquisition of vital information. MiFID2 will mark the beginning of profound industry changes, accelerated by the digital revolution. Within these changes lie opportunities. Tomorrow’s winners will be those who are the most adept at turning MiFID2’s obligations into operational advantages. Between ETFs and “robot advisors”, not to mention increasingly complex and unpredictable regulations and financial markets, active asset management is nowadays under fire. Its long-established model is being undermined, starting with the acquisition of the information that is so vital to the investment process: the research. In a few months’ time, the research will have to be paid for in its own right, marking an upheaval in the historic model whereby it always appeared to be provided free of charge. The question that has been facing asset management companies since January 2017, is how to finance research? In fact, MIFID II, the European regulatory event of the year 2018, heralds the start of a sea-change in the asset management industry, whose outline can already be glimpsed in the newly stated intentions of the regulators. Meanwhile, the digital revolution that is taking place concurrently is fanning the flames of change and is likely to extensively redraw the landscape of the winners of tomorrow. Technological innovation, with the onset of “robot advisors” and their algorithms, that threaten to automate asset management. Under fire from both sides, what is the future for asset management? Its raison d’être, market-beating performance, is essentially underpinned by the process of collection, analysis and circulation of information in investment firms. This information –research – is necessary, one might even say indispensable. And yet the industry that produces it is highly unusual – peculiar even. It is a market worth twenty billion dollars per annum, where very little is bought or sold. The discretionary costs of execution pay for free and unlimited access to the research of the world’s leading brokers. Another key characteristic of the investment market is even more extraordinary when compared to other industries. Asset owners pay not only for the final investment product but also for the raw material that is used to produce it. Imagine buying a suit, and being presented with a bill for both the suit and the fabric. Since time immemorial, the end-clients of asset management companies have been financing the acquisition of their asset managers’ research through client commissions. This model, while financially advantageous, is subject to known limitations that are counterproductive. The obvious conflict of interest in providing endless investment advice to generate a maximum of execution turnover has been in the regulators’ sights for nearly 15 years. This is an industry with excess production – it is believed that only 5 % of research reports are actually read. This excess also has a negative impact on quality, an additional hindrance for asset management companies trying to identify the best sources of alpha. Could it be that research, the key tool for active asset management, is in fact inefficient? MiFID II will irrevocably separate research from execution. A 40-year-old economic model is about to disappear, and a market for paid research will emerge in its place. Thankfully, it will still be possible to charge the client for the fabric of the finished suit, but with some new caveats. Asset managers will have to draw up a yearly budget in advance and perform a qualitative assessment of the research that they consume. Research will become a paid service, and the main problem for its consumers will be to determine its actual usefulness: the return on investment (ROI), a concept that is not at all alien to Finance. But how can this ROI be calculated? If a management company wants to continue passing on the cost of research to its end-clients – and thereby preserve its margins – the first, tangible ROI merely relates to the cost of implementing the new budgeting and assessment processes. However, by accurately monitoring its consumption and comparing the relative value of its various sources of research, an asset manager can optimise its expenditure, achieving potential savings estimated at around 15%. The bigger the management company, the greater the savings. The tools that are required to attain such results can be built using current technology. But year after year, the figures consistently show that the Finance sector is reluctant to invest in its future. It is no surprise that FinTech operators have snatched the technological initiative from traditional players. 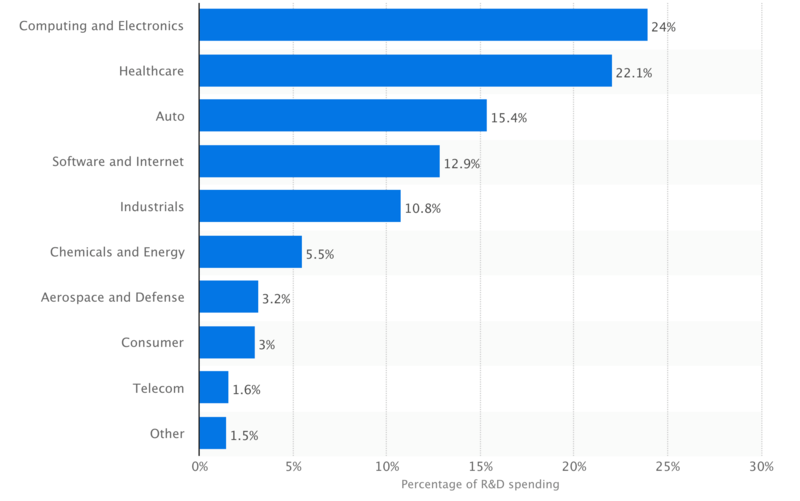 When one compares the world’s major industries, Finance places dead last in terms of R&D expenditure – less than 1.5%. Since the financial crisis, the industry has focused mostly on cutting costs, neglecting to invest in its future growth. The intangible ROI, which is, granted, harder for a management company to implement, is essentially tied to the digital revolution that is so radically transforming the world that we knew it, pre-21st century. This new ROI is set to disrupt the very core of the investment process. Intangible ROI may be powerful, but how does one quantify the intangible? The new networked digital tools (tablets, smartphones) enable us to connect to all the forms of knowledge, to enhance them and to process them almost instantaneously. In the 20th century, we were consumers; in the 21st century, we can all consume, create and share. With the digitisation of information and the rise of spaces where research will inevitably be concentrated — “Online Research Marketplace (ORMs)” — asset managers will be able to save time and ensure lasting efficiency gains thanks to the use of artificial intelligence, increasing their capacity to define and identify the truly important inputs for their investment decisions. Asset managers are professional readers, key players in content generation. They annotate, highlight, sum up, create new notes, and share the outcome. All these actions give rise to “qualified links” between the analyses, the notes and other collections of miscellaneous articles. In the digital space, these “links” cause information to appear under a new light. There is talk of a new topography of knowledge, which is no longer hierarchical, nor even organised in tree structures, but networked. The Internet reveals the true organisation of information, which has always been linked, nested, interdependent. But the rise of the digital world is generating consequences that go deeper than merely linking information. It provides a means of quantifying the processing of information, by logging and measuring the things that work. It also provides a means of modelling various scenarios, and running them again and again. This opens the prospect of an approach based on actual data rather than mere assumptions, and might eventually give rise to a genuine science of investment. Other industries are beginning to benefit from this new way of seeing things. Online education, for instance, correlates the actions of the students – their “clicks” and “feedback” – with their results, thereby improving the learning process continuously and dynamically. To win the war, and not just the current battle, active asset management must change — to begin with, it must embrace the digital revolution, as a stepping stone towards new uses for research. Tomorrow’s winners will be those who are most adept at quantifying and controlling their investment know-how. A columnist for the New York Times once wrote most eloquently that “Big breakthroughs happen when what is suddenly possible meets what is desperately needed.” But we will have to start off by changing our paradigm, and active management companies will have to find an answer to the following conundrum as soon as possible: Is it up to research to generate investments, or do we urgently need to invest in research? Fabrice Bouland is the CEO and co-founder of Alphametry. Prior to launching Alphametry, he founded and managed for 10 years the institutional broker OTCex-HPC, a global group of 200 employees operating on all asset classes. His first venture in 2000 was the first European web-based marketplace for OTC derivatives, still in used today by the world's largest banks. He previously spent 10 years at BNP Paribas as an equity derivatives trader in France and Germany.